Sorry readers, I know it’s been a while since I posted a new playlist. Work has been all-consuming lately, so I’ve been recycling older playlists in my classes for the last month. I always keep an eye on iTunes for new music though, and I’ve got some stuff I think you’ll like. This ride veers from dance to alternative to pop and even folk music. After I put the playlist together and tested it, it occurred to me that many of the songs relate to stages of life: Alive makes the point that you’re never too old to party; Bohemian Like You is about the pre-career days of one’s early 20s; Closer to Fine deals with university angst, while Old School reflects back on the journey to adulthood with more than a little amazement. Sing for You is also contemplative – I don’t know if Tracy Chapman has children, but I imagine the song as a mother’s wistful look back to when her children were small. Speaking of small children, I couldn’t resist adding a pic of my niece, Macy as the bicycle photo for this post. 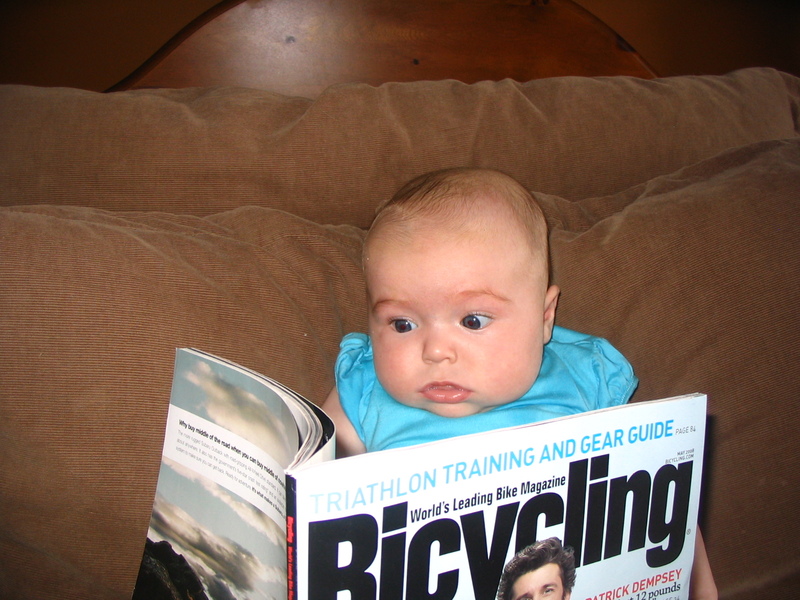 Her parents are both avid cyclists, and judging from her interest in the magazine, it looks like Macy might be, too. Unforgivable (First State Remix) [feat. Jaren] – Armin van Buuren (6:22): Warm up with the latest from lawyer-turned-DJ van Buuren. After 1:00 of easy spinning, find enough tension to match your cadence to the music – 4/10 or 5/10. This is a lengthy song, so for a 30 minute class, I start the music around 2:28, which is where the singing starts. Alive – Creature (4:02): What a fun song from this Montreal band! Just because you’re 65 doesn’t mean you don’t know how to party. This is a fast climb. Find the beat. Start with your tension at a challenging 6/10 and take it up a notch to 7/10 later. I Don’t Care – Fall Out Boy (3:39): High tension sprints to the latest song from FOB. There are three of them 30/30/35 seconds in duration, at 0:45 – 1:15, 1:45 – 2:15, and 3:00 – 3:35. I want your tension at 5/10. Advanced riders, do one or more as standing sprints. Why? Because we can. Poker Face – Lady GaGa (3:57): This song and the next one work equally well as climbs or lifts. We’re climbing for this one. Leave the tension where it is at 5/10. Turn up the tension right before each chorus. Beautiful U R – Deborah Cox (3:52): Time for some high tension lifts. The beat of this song is slower so I want that tension cranked – 7/10 or higher, or you’ll just cruise through this drill. Nice controlled movements up and down, palms on the handlebars for balance, but being sure not to use your arms to pull yourself up. This drill is all about legs. We’re going to start with 8 counts for the verse, and 4 counts for the first two choruses. For the last chorus, take it to 2 counts and finish out the song on 2 counts. Bohemian Like You – The Dandy Warhols (3:34): We’re going to speed things up with this 90s West Coast alternative band. There’s a definite Rolling Stones influence to this tune, which is on the soundtracks for TV”s Buffy the Vampire Slayer and Six Feet Under. Take the tension down to 5/10. We’re going to work on endurance with two push periods of 1:12 and 1:23 with a 15 second rest in between. What’s a push? Speed up your cadence by about 20% – not an all out sprint, but a pace you can sustain for 60-90 seconds, with some difficulty. The pushes are at 0:36 – 1:48 and 2:04 – 3:27. Old School – Hedley (3:41): This Canadian band is fronted by Jacob Hoggard, who was 3rd runner up in Canadian Idol in 2004. Hoggard muses about growing up on this gorgeous anthemic track that could surely be the soundtrack for anyone’s 20-something years. It’s been on heavy rotation on my iPod since I discovered it in September. The drill is a grind of a seated climb. Start easy, with the tension around 5/10, but increase the tension every 30 seconds: 6/10, 7/10, 8/10, 9/10. Wherever you’re at, when you get to the crescendo at 2:40, take it all the way to 10/10 and push through to the top. The music will take you there. Remember not to let your cadence fall below 60 rpm – your max is the highest tension you can manage at that cadence. Closer to Fine – Indigo Girls (4:02): This 1989 folk-rock hit was the soundtrack to my law school years. A student two years ahead of me scrawled the stanza about going to see a doctor of philosophy on the bathroom wall at Domus Legis, the law students’ ramshackle, wildly illegal, 24-hour pub. Fast forward 17 years: Domus is gone, victim of the wreckers’ ball, and the student who wrote the lyrics on the wall is gone, too, to cancer far too young. This song always reminds me of her, and of the need to make every day count. Sing for You – Tracy Chapman (4:25): Her latest track. If you’re unfamiliar with this talented folk singer’s work, check out her self-titled debut CD, full of haunting songs like Fast Car and Talkin’ Bout a Revolution. Cool down and stretch.